It was late June. The temperature was 95 degrees with 110% humidity. The monkey was definitely on our backs, as my boss would say. 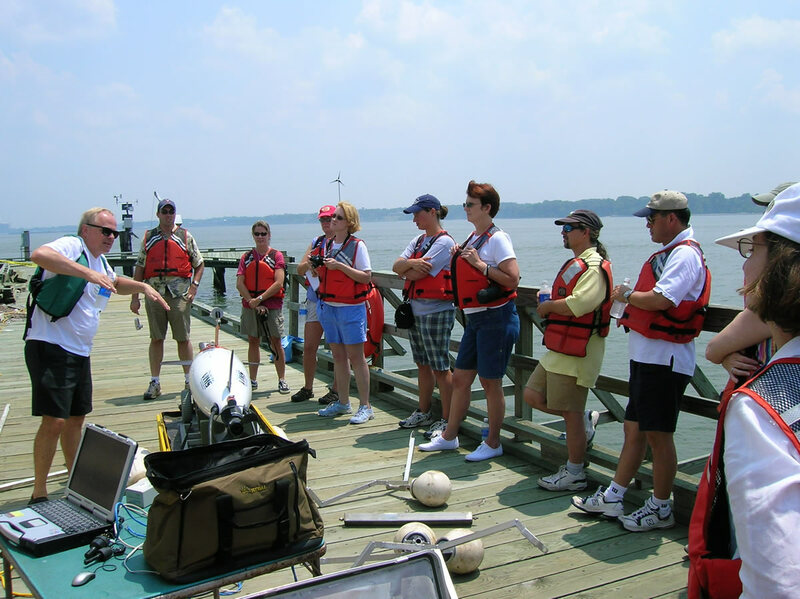 My co-workers and I stood there on the dilapidated VIMS pier with 12 high school science teachers, VIMS scientist Mark Patterson, VIMS technician Todd Nelson, and the Autonomous Underwater Vehicle (AUV) Fetch. We were all decked out with our life jackets, as if we weren’t hot enough. We had no clue what the day was about to bring. Mark delivered a brief talk about Fetch and how he uses the robot for his coral reef research. We stood there simmering in our own juices. After the lecture, several teachers helped assemble the floating cradle used to launch Fetch. Those with tools diligently put the cradle together, while others photographed the scenery, took in the view, and continued to sweat profusely. 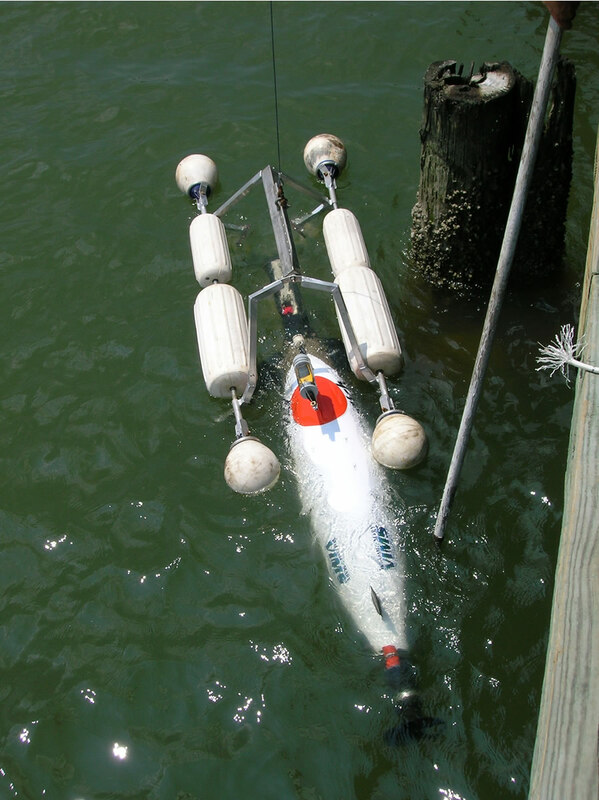 Once assembled, we moved the AUV in its cradle over to the dock’s crane, maneuvered it over the water and slowly lowered it to the water’s surface. With an eager crowd of teachers watching over his shoulder, Mark took the controls and began maneuvering Fetch away from the dock as the teachers “oohed” and “ahhed.” Mark soon relinquished control of the robot to the group. As the teachers looked on and took turns steering, one noticed that the AUV was no longer acting normally. No matter which direction she steered it, Fetch seemed to be under some other control. Nervous that she had broken the $250,000 piece of equipment, she quickly gave the reins back to Mark. “I’m not cutting my line. I caught this thing, I’m landing it. It’s MINE now!” he explained. I built up the gumption, “Cut the line now, or I’m going to do it for you.” By then I realized that this guy caught the AUV on purpose. He continued to refuse to cut the line, so I made my move towards a bait knife I spotted sticking out of the pier railing. The fisherman was shouting, “Look what I caught! Best catch of the day!” I grabbed the knife and without hesitation, cut the line. Just then I spotted my VIMS comrade, Todd, running down the dock with a giant boat hook ready to catch the now-adrift AUV. After the intense tug-of-war between the fisherman and Mark, Fetch’s battery was just about shot. 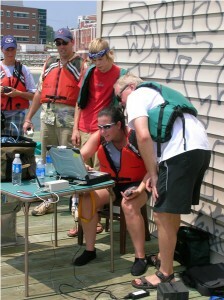 The AUV was now in “survival” mode, using its remaining juice to maintain one-way contact with the computer. 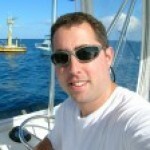 Todd managed to get the AUV into ankle-deep water and run the 250 pound AUV aground. Unbeknownst to all us during the debacle, we had neglected to remove Fetch’s cradle from the pier crane and with the rising tide, it had come loose and was also now adrift. In an act of desperation, Mark’s summer intern, Michael, a student from the local high school, jumped in the water and swam out to the cradle. He grabbed it, and headed to shore to meet us. As Michael brought us the cradle, out of breath, the fisherman asked for me to take a picture of him with the robot. As an offer to the karma gods who kept this guy from knocking me out, and to keep the fisherman civil, I obliged. Finally realizing that he may have behaved poorly, the fisherman offered to help us get Fetch into the cradle. Mark politely declined his offer. Todd removed the fisherman’s rig from the AUV and gave it back to the fisherman, who walked away with the queen mother of all fishing stories. We wrangled Fetch into the cradle, up onto the beach, and into Mark’s minivan. I repeatedly thanked Mark for the opportunity he provided the teachers and offered my help in fixing any damage to Fetch, convinced that he would never work with us educators again!